In an unplanned addition to our weekend room renovations, Paul came home with not one but two of these. That's right, I sent him to Ikea to buy Paulie a bookshelf/desk and to "see if you can find anything to store my yarn", and he came home with 2 of the exact same thing. My first thought was where in the world are we going to fit that monstrosity I wasn't planning to have. After playing with a few spaces, we decided to rearrange our bedroom and add a crafting corner. We are fortunate to have a spacious bedroom, although I've always appreciated the fact that we had our bed and an antique wardrobe at one end and a couch-and-chair sitting area at the other. The simple arrangement and not-overloaded-with-art walls appealed to me as a retreat from the often cluttered rest of the house. 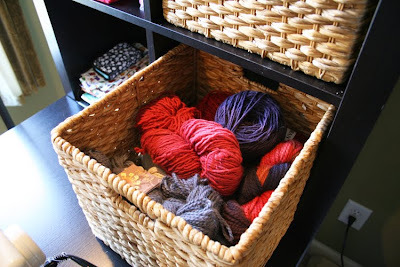 (That's not to say we aren't often cluttered with laundry, waiting to be folded, in here!) Even with the new bookshelf/desk, our couch and chair still fit on that end of the room without looking too crowded, and I definitely intend to enjoy the addition of my crafting space! 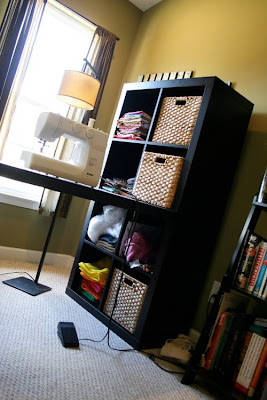 Having this much space to keep fabric and other crafting materials all in one spot and easily accessible is so wonderful! The desk provides a good amount of workspace and now I don't have to lug my sewing machine down to the dining room every time I want to squeeze in a bit of sewing time. 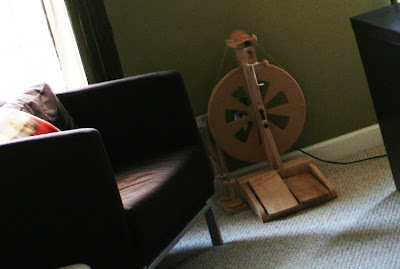 Of course, the spinning wheel still sits idly against my bedroom wall. I have big plans though. I'm hoping to take a spinning class at a local yarn shop next month! Yay for freshening up all these rooms in one weekend, and double yay for a dedicated crafting space. And the biggest yay for a super-hubby who makes it all happen! Those shelves are exactly what I need for my new studio space...except the closest Ikea is in another country!!! Oh how nice! <3 Doesn't it make it easier bto sew when the machine is out? 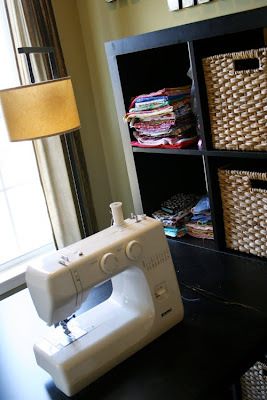 I am sewing non-stop now where as when my mahcine was stored away and lugged out on the kitchen table I barely used it. I am green with envy! I think your master bedroom is bigger than our boat ;) I am coming right over for a sewing/ knitting lesson. I tried teaching myself to knit today and failed miserably. I cast on and then uncast all my stitches. That is SO great! I promise you, you'll be in there ALL THE TIME now. That's what happened the minute I got dedicated studio space! I am jealous, Joy! 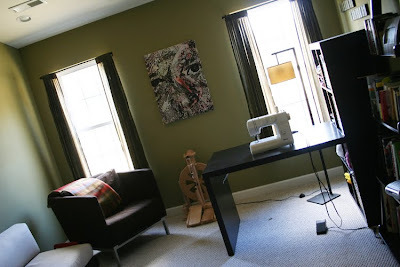 I still use our dining room table for my crafting and have to lug my sewing machine out of a closet. Yeah for organization and awesome hubbies. ditto libby! But, we're taking similar pics in hopes of selling this bungalow & our next stop NEEDS a craft space! Wow! That is one big bedroom! How wonderful to have such a great spot set up where everything can be in its own spot! Thank you for including the details of where you found this, it looks like a perfect crafting spot! Joy, that looks so great! I was thinking how nice it'll be in the evenings when the kids are in bed and you can be sewing and crafting right there in your pretty and peaceful bedroom just down the hall from the kids. :) Yay for Paul! What a great eye he has! What a WONDERFUL hubby to bring such gifts! i have just read through all your room make over posts. i am so impressed with how much work you got done and how nicely the rooms came together. what a satisfying feeling you must have! and YAY for the crafting space. i carved out a little nook for myself in our finished basement room and i love it! Your new fave spot looks very comfy! 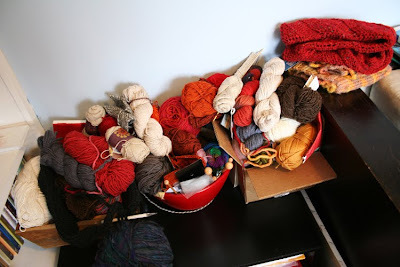 ... and the home for your spinning wheel, I am absolutely beside myself! 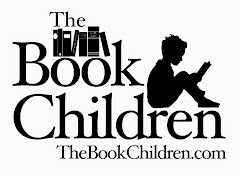 Gorgeous space for all the lovely work that you do!